I was cutting things close. I had a presentation to give at noon just outside of Dallas, and my morning flight was late. The employees in this office were being forced to attend, and any tardiness on my part was not going to make them any more inclined to pretend to listen to me for an hour. I quickly made my way to the Hertz rental car counter at DFW, which is no easy feat given that the airport property takes up more space than all of Manhattan. I had Hertz VIP status thanks to the company, which doesn't do much of anything except expedite the check-out/check-in process by about 3 minutes. But on this day, that 3 minutes mattered. It was 11:30am. Me: "Hi, I'm here to pick up my car for the day." Hertz agent: "Ah, yes. Hmmm... it looks like we're all out of Economy Class cars today. Would a Smart Car be ok instead?" 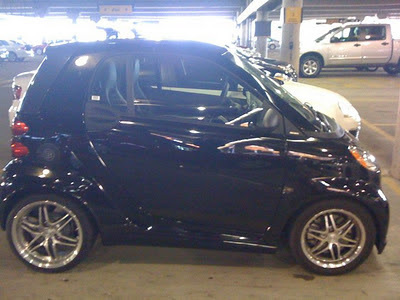 Smart Class Car? What was that? I didn't care. I had a conference room full of annoyed engineers and managers waiting for me to get my yakking over with, and I just needed a set of wheels for the half-hour drive. Both my bag and my jaw dropped. "%#$&. My. Life." A Hertz worker turned his head to look at me as I cursed this roller skate on steroids. I cursed Hertz. I cursed the entire state of Texas. I cursed rainbows and soft, fuzzy kittens. What on earth was Hertz thinking renting something like this in Texas? TEXAS. The land of super highways, speed-of-light driving, and larger-than-life vehicles. It should be illegal to drive these little toasters in this state. I could probably kick this thing across the garage. I looked at my watch: 11:35am. I had two choices. Take off in this soup can, play Frogger with extended-cab trucks on the freeway, and surely die. Or go back to the Hertz counter and throw a fit in order to get a real car, arrive late to my presentation, and get drawn and quartered by a bunch of pissed-off engineers. Given the fact that I was toast in either case, I got in the fuel-powered roller skate. I knew I was in serious trouble as I made my way out of the rental car garage. This thing had the handling of a tanker ship. I fought with it at every slight turn just to stay relatively in my lane. The pedals were so sluggish that I could have sworn they'd had a big night out with Jim Beam the night before. The entire apparatus lurched, shook, and vibrated. On top of all that, I noticed that the roof of the "car" was made entirely of glass. Which meant that the entire top half of this death trap consisted of glass. I would have rather embarked on this trip on a crotch rocket without a helmet. Upon exiting the garage, things did not improve. The RPM dial fluttered into the red zone as I climbed up the freeway entrance ramp at the rocketing speed of 35 mph. It stayed in the red zone as I dodged SUVs, pickup trucks, 18-wheelers, and shocked looks from other drivers all the way to the office. I burst into the conference room at 11:58am. I threw my stuff down and started speaking. After the presentation was over, I gave a sigh of relief that I was still alive. I successfully dodged death from both the "car" and the engineers. But I still had to steer Death on Wheels back to DFW. I also had to give my boss a ride. He clutched his laptop case to his chest with white knuckles the entire way back. As we pulled into the airport in glorious survival, the Hertz employee that came over to check us in chuckled and said, "How'd you like your scooter?" I shot him an annoyed look and walked off cursing Hertz, the Smart Car, and all the soft, fuzzy kittens I'd forgotten the first time around. If you've never had the occasion to get behind the wheel of a Smart Car, I highly advise you to keep it that way. Your blood pressure and your loved ones will thank you for it.